Music critics give their verdict on Led Zeppelin's eagerly-awaited reunion concert at the O2, in London. Led Zeppelin returned to the stage with their first full set in 19 years - and younger members of the crowd had heard nothing like it. Manufactured pop is ruling the charts and young music fans are an impatient sort. Maybe that's why the bars filled at the O2 Arena in Greenwich filled during some of the band's winding rock epics. But their classics proved music doesn't rock like it used to. Tracks like Whole Lotta and Stairway to Heaven had every one of the fans - who included Liam Gallagher and Sir Paul McCartney - on their feet and shaking their fists. It's been a long time since they rock and rolled... and as singer Robert Plant, 59, guitarist Jimmy Page, 63, and bass player John Paul Jones, 61, launched into the first few numbers of Good Times, Bad Times and Whole Lotta Love last night, we suddenly realised just how much we had missed them. Page may no longer swagger across the stage, his guitar worn low like a gunslinger as he churns out riffs. And Plant can't scream and strut like he did in his rock god heyday. But as they took to the boards for their feverishly anticipated comeback concert, it became clear the music had lost none of its awesome power and majesty. With the possible exceptions of The Beatles and Pink Floyd, no other band reunion could excite the fervour prompted by Led Zeppelin's long-awaited appearance at the O2. Certainly, it's hard to imagine any other act charging a whopping £135 for a ticket. Expectations would already be high whatever the price... although there is a point at which the cost virtually ensures satisfaction. If you've paid £135, you have more of a vested interest in believing you've had a great time than if you'd only paid £20 or £40. So although the terms "awesome" and "brilliant" could be heard amongst the departing throng, they were perhaps more an inevitable self-affirmation than a considered judgment on the show itself - which like all performances, had its highs and its lows. You might think it couldn't possibly live up to expectation but, it transpires, the opposite is in fact true of Led Zeppelin's first public appearance in 19 years. If there were sceptics here tonight - there weren't but just for the sake of argument consider it - Led Zeppelin silenced them and banished any rotten memories of their shambolic Live Aid reunion. More importantly though, what they have done here tonight is prove they can still perform to the level that originally earned them their legendary reputation. Events that have so much resting on them rarely unfold with such an air of assurance. The three original members of the band and Jason Bonham, the drumming son of John Bonham, seemed relieved to be relinquishing the burden of anticipation. Their heaviosity has always been the cornerstone of their reputation but it was astonishing to see how funky they could be for a rock band. 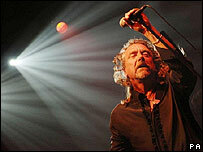 "It's been a long, lonely time since I last rock 'n' rolled" screeched Robert Plant. Well, at least since he has showed this sort of fire-eyed intensity. And so, was it all for a one-off show in memory of their label boss Ahmet Ertegun? Come on. With a synergy like this going on, it would be an act of cosmic perversity to stop now. Some rock bands accelerate their tempos when they play their old songs decades after the fact. Playing fast is a kind of armour: a refutation of the plain fact of aging. But Led Zeppelin slowed it down a little. At the O2 arena here on Monday night, the band found much of its old power in tempos that were more graceful than those on the old live recordings. The speed of the songs ran closer to those on the group's old studio records, or slower yet. Good Times Bad Times, Misty Mountain Hop, and Whole Lotta Love were confident, easy cruises; Dazed and Confused was a glorious doom-crawl. If nothing else, you could never accuse [Robert Plant] of adding to the mountain of hype surrounding the band's re-formation. He certainly doesn't perform like a man entertaining serious doubts about anything - for all the pre-emptive discussion in the media about his inability to hit the notes he once could, Plant sounds fantastic, and retains an utterly magnetic and startlingly lithe presence on stage. Their previous reunions have been brief and shambolic: a rotten set at Live Aid, an under-rehearsed appearance at a record label birthday party. Tonight, however, after a tentative, feedback-scarred opener of Good Times Bad Times, it's difficult to believe this is a band who have barely played together for the best part of three decades. They sound awesomely tight. As the lucky critic who was handed this dream ticket, I have to say that I was in my own fever of anticipation in the days building up to the big event... could it possibly live up to the expectation? Well: I was blown away. The familiar old sinew and swagger were still there, singer Robert Plant's voice seeming untouched by age, guitarist Jimmy Page, his hair now almost white, firing off little solos that were a taste of things to come, John Paul Jones's bass twisting and driving, Jason Bonham's drums crisp and powerful. And so it went on: they never flagged, although the crowd seemed a bit limp at times. Bonham was astonishing: he didn't just lock into Jones's base grooves - he played off against the guitar and the vocals. He was listening. And they had clearly done a lot of rehearsing. Dazed and Confused! Since I've Been Loving You! Stairway to Heaven! They were fantastic. Better than I expected. It was a joy and a privilege to be there.